Our selection of point-of-sale displays have been designed to enhance our product branding, increase product exposure and attract the attention of buyers within a retail environment. The displays are of a high quality include information about the products on display and encourage customers to read the information to assist them in their purchasing choice. Wherever possible our PowerLED point-of-sale displays also include working samples to create an aesthetically pleasing display that also shows of the products to further encourage customers to ultimately buy the products on display and therefore increase the sales of our customer base. Whether you are looking to promote a new product, or remind your customer base of older products, which have previously been stacked on regular shelves amongst other products, our point of sale displays are ideal to display the merchandise and grab the attention of customers. Line of sight light-box header for increased visibility and brightness to create contrast to it’s surroundings. To attract further attention our RGB LED flexi-strip stand incorporates samples of the single colour and RGB led flexi strips, allowing customers to see the product in use and play with the RGB tape settings to see the various effects before they buy. You can include our add-ons within your store display by utilising the additional hanging arm for EXT Aluminium Extrusions. 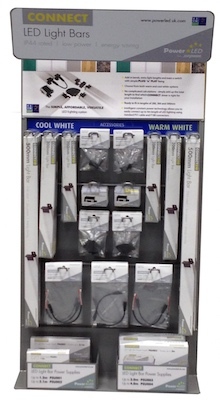 The CONNECT Light Bar Stand is designed to be installed on slat walls commonly used within distribution stores. Displaying the different lengths and light colour options for the light bars, as well as the available accessories and a handy information leaflet, the stand promotes the sale of complete kits. With the optional Light header, which includes a sample of both the cool white and warm white CONNECT light bars, you can demonstrate how versatile they are, lighting up several different materials to show how the light colours enhance different surface types. This assists your customers in their light colour choice, opening up the customers visual ideas for both products and potentially push sales of the LED Light Bars. Once you have placed your order a date will be given to you for the stock and stand to arrive (or you can select one to suit you); your regional salesman will install and talk your staff through the contents of the stand and the concept. We then recommend a breakfast morning or launch event (usually the same day) where we urge branches to invite customers to make the most of having our stand on site to demonstrate and answer any questions they may have. Having a good product is fundamental, but a good display plays a big part, as this is the first port of call to draw customers in. Positioning your point of sale displays in high footfall areas will maximise the number of people who will see them. Don’t forget to keep your point-of-sale displays stocked and maintained – if products on the display are low or the stand is not looking its best you may miss out on a sale. Posters and Leaflets to take away are a great way to share information on our products, spreading the news of new products and increase the awareness of existing stocked products or seasonal promotions. Most of our point of sale displays include leaflets for customer to take information away with them to know more about the product, put some thought into their potential purchase, and potentially share it with others. Our leaflets include essential information on the products to ensure the customer has the tools required to make a confident decision to contact and convert to a sale. All of our POS products are supplied in colour packaging, designed to promote the Brand and make product selection easier by clearly displaying key product data. The packaging helps to communicate the quality and reliability of our products, stimulating customer interest and motivation to buy.